The TS Grind web site was key to launching the new division. Click to see the web site. IPG Corporation is a second generation, family-owned business that provides precision grinding of mechanical parts. They had developed a niche in grinding thermal spray coated parts, particularly for the aerospace industry. This is a highly specialized parts finishing service. They had a desire to expand this end of the business. One of the first things we did was to separate out the other services they perform from the grinding of thermally sprayed parts. We gave this process a branded name - TS Grind - which we registered as a trademark. Next, we created a new web site just for the TS Grind process. This service relies heavily on collaboration between the IPG staff and their customers. We marketed this aspect of customer service on the web site. We then helped launch the new division. With an emphasis on this niche market, IPG Corp invested in new machinery. We created an awareness marketing campaign that emphasized the branded process and the expanded capacity of the TS Grind division of IPG. 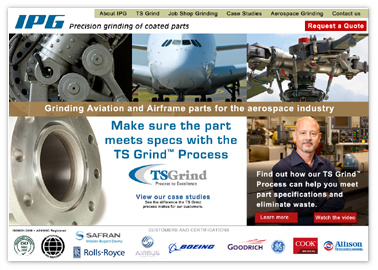 By separating TS Grind from other services, we were able to market directly to aerospace parts manufacturers and design engineers who had a stake in making sure the part was correctly coated and ground. This single focus was successful in making a critical connection between customer and client.